Our Retro Eriba Puck is the smallest retro caravan of family. 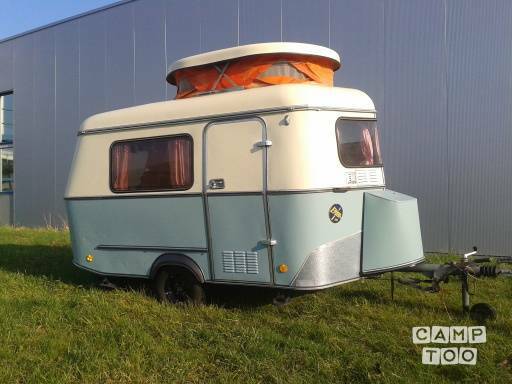 The Retro Eriba Puck is a small cute two-person caravan with a lifting roof. and both a fridge Retro Eriba Puck also has a dining area that 's can easily evening transform into a lovely double bed 1,55x1,87 meters. The height is about 1.85 meters, and has an unladen weight of 415 kg. If you have a B license you may associate this caravan behind your car. As this caravan a narrow width (1.65 m.) And a low weight (max. 600 kg incl. Cargo) is easy to drive because the caravan is wider than the car. Our Retro Eriba Puck has BOVAG inspection in 2016. If force majeure Eriba Retro Rental can not fulfill the loan agreement, the borrower will Eriba Retro Rental never incur liability. Eriba hire will then possibly paid loan amount and / or deposit refund within 14 days.